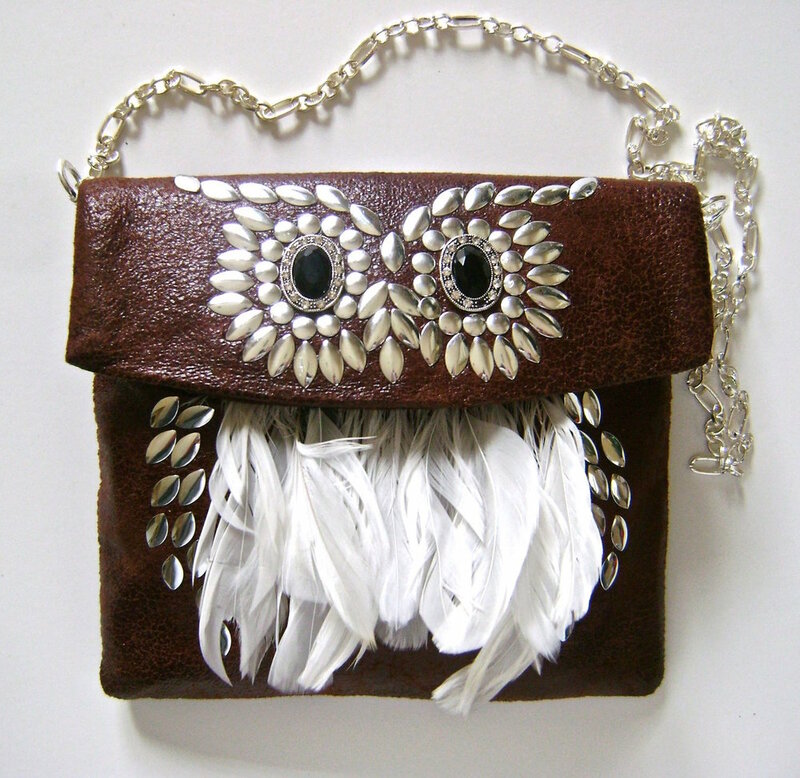 Every diva needs a novelty purse and this one is unique with it’s faux leather, feather and metal accents. It measures 6” wide by 6.5” long and features two inner pockets large enough to carry an iPhone 6s. A magnetic clasp holds the flap closed and silver chain serves as a strap. The “heavy metal” pieces are nothing but hot fix elements you attach to the fabric with an iron. The template for the face is included with the instructions. If you have a Harry Potter fan in your family this Hedwig wannabe would make a great gift! step 1 - Download the pattern and instructions. Cut out pattern pieces and fuse interfacing to all pieces except the feather cover and pocket. step 2 - Sew interfacing along curved edge of feather cover to fabric with right sides together. step 3 - Trim the seam. Turn the two pieces wrong sides together and fuse. step 4 - Baste the straight edge of the feather cover to the edge of the front matching notches, with wrong side of cover against right side of fabric. Cut out a piece of interfacing that will fit under the cover. step 5 - Slip feathers under the interfacing centered on the front. Iron the interfacing to hold the feathers in place temporarily. Do not iron the feathers. Check to be sure the cover will hide the quills once sewed in place. Apply glue to the feather quills to hold them permanently. Allow the glue to dry. step 6 - Topstitch the cover to the front piece close to the curve and across the feathers. Attach nail heads to the sides of the feathers to complete the owl design. step 7 - Sew the curved edge of the fabric flap and lining flap with right sides facing each other. step 8 - Trim the seam allowance and topstitch it to the lining. (I used the same fabric for my lining as my outer purse.) Use a piece of chalk to mark the placement of the clasp on the flap lining. step 9 - Trim the seam allowance from the front flap pattern piece and align the pattern with the fabric edge. step 10 - Stick pins in the four corners of the nose piercing through the fabric. Pull the paper off the fabric without disturbing the pins. step 11 - Position 5 nail head pieces within the pins. Remove the pins. Cover the nail heads with a cloth and hold an iron on them for about 45 seconds. step 12 - Align the pattern piece to the fabric again. Position the center eye bead and border it with pins to mark its placement. Remove the pattern, then the pins. step 13 - Circle the eye with round nail heads. When the circle is complete, follow with the placement of the oval nail heads, including the eyebrow. Cover them with cloth and press with the iron. step 14 - Work on the right side eye and eyebrow following the same steps. Glue the eyes to the fabric and allow to dry. step 15 - With right sides together, sew the pocket interfacing to the pocket fabric. step 16 - Turn the pocket pieces wrong sides together. Create a .50” hem at the top of the pocket. Cut off the .50” excess interfacing and fuse the pocket pieces. step 17 - Pin the wrong side of the pocket to the right side of the back lining matching the top edge to the arrows. Baste the vertical edges. Sew a seam down the center of the pocket to create two compartments, or sew one side wider than the other to accommodate a larger phone or other device. step 18 - Cut away .75” from the bottom edge of the back fleece piece. Tuck the fleece top curved end into the curved end of the flap and pin in place aligning the long side edges. step 19 - Position the plastic mesh piece against the wrong side of the back lining, in between the fabric and the fleece. Fit into the flap curve. Trim edges of the mesh if necessary so they will not be caught in the seams during sewing. The clasp prongs are all that’s necessary to hold the mesh in place. step 20 - Cut a piece of stiff cardboard a little larger than the size of the clasp. Mark and slit the prong openings. Adding this cardboard when you apply the clasp isn’t absolutely necessary but I like how the strength of the cardboard supports the clasp. step 21 - Place half of the clasp into the right side of the back lining, through the mesh, the fleece and the cardboard. Bend the prongs. step 22 - Sew the sides of the flap with right sides together. Sew only to the round dots on the back lining. step 23 - With right sides together, sew the top edge of the feathered front to the front lining. step 24 - Cut away 1.25” from the front fleece piece. Align the top edge of the fleece to the top of the front and pin in place aligning the long side edges. Only the sides should be sewn into the bag. step 25 - With right sides together, sew across the bottom edges of the lining pieces matching the notches. Sew only 1.25” from each side edge with normal stitches. Sew the middle of the seam with a basting stitch. Press the seam open and remove the basting. the strap stitching. step 26 - Attach the other half of the clasp to the center of the feather cover. See the pattern piece for placement. step 27 - Sew together the bottom seams of the back and the front with right sides together. step 28 - Lay the work flat with the bottom seams to the left and right and the flap sticking up in the center. One bottom seam should be partially open. The purse back is against the front and the two linings against each other. You will be sewing the open side seams from the bottom edges to the round circle (see red arrows) leaving the flap free. Turn the piece wrong side out, lay the work flat, pin and sew the side seams. step 29 - Trim the seams and cut the corners diagonally. Pull the purse right side out through the opening in the lining. Slip stitch the lining closed and stuff it into the purse. step 30 - Hand sew the round end of a toggle clasp to each top side edge of the purse. Attach chain to the clasp. My rhinestone rimmed, black eye beads were slider beads with loops on the back. I cut off the loops with wire cutters so they would lay flat on the fabric and adhere with glue. I’ve had them for a long time and don’t know where they came from. You can substitute your own black flat beads and attach hot fix rhinestones around them to create a similar look.